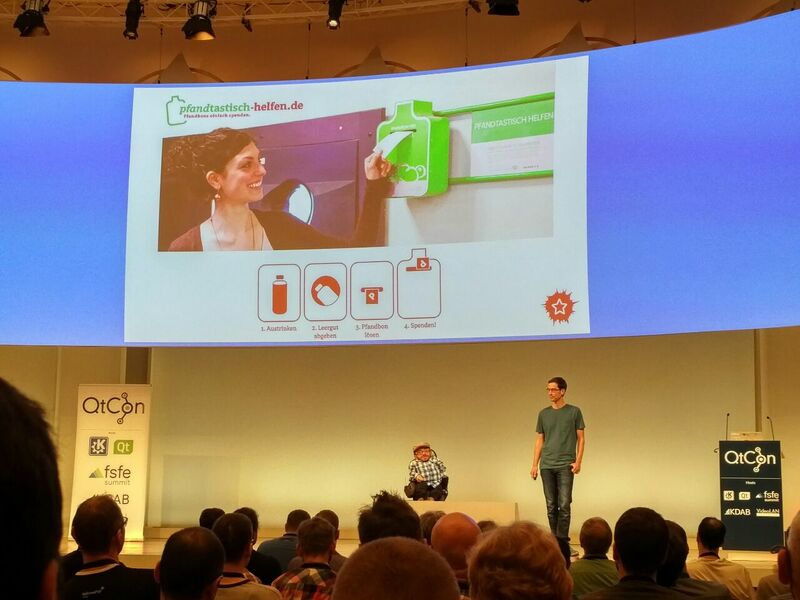 QtCon has opened in Berlin at the fabulous Berlin Conference Centre. It started with a welcome by president of the KDAB group and one of the original KDE developers Matthias Kalle Dalheimer. He welcomed the different but related communities together and encouraged developers to talk to each other. This is a unique opportunity for volunteer and employed, open source and proprietary, student and old-timers to come together and exchange thoughts, needs and have some fun. He also welcomed representatives from all the communities on stage. Lars Knoll from Qt Company said how they straddled both proprietary and open source worlds and asked for people to talk to them about missing or lacking features in Qt. Lydia Pintcher from KDE presented our new KDE vision "A world in which everyone has control over their digital life and enjoys freedom and privacy." Jean Baptiste from VLC said it was exciting for a bunch of hackers to Berlin when all they had wanted 15 years ago was try to keep the university network busy with Doom. Erik Albers from Free Software Foundation Europe said they were happy to be celebrating 15 years of existence and invited us to their parties over the weekend. Our keynote from German disability campaigners Raul Krauthausen and Holger Dieterich talked about how people use open data and software for social activism. He told the story about how they collected used bottles for the recycling refunds to help their group of disabled activists. But there was no information about where the recycling facilities were or whether they were accessible with wheelchairs. There was no data available. So they used OpenStreetMap to facilities of all sorts are available to create Wheelmap which lists facilities that are accessible. The project started to get feedback of people who said their lives had been changed and quickly a community of volunteers around the world translated it and picked it up in other countries. It was advertised by Google even though it used OSM rather than Google Maps which got many more people interested who ported it to other platforms. They took it into school to teach pupils about the needs of wheelchair users and how to feed back to the map. They concluded by saying that open data is now fashionable with many local and national governments exploring the possibilities. There are other projects who do similar work than wheelmap but it doesn't all exchange. They hope to make one service which can be connected to once, which is completely open source and which anyone will use. This changes people's lives so they can travel the world without restrictions. 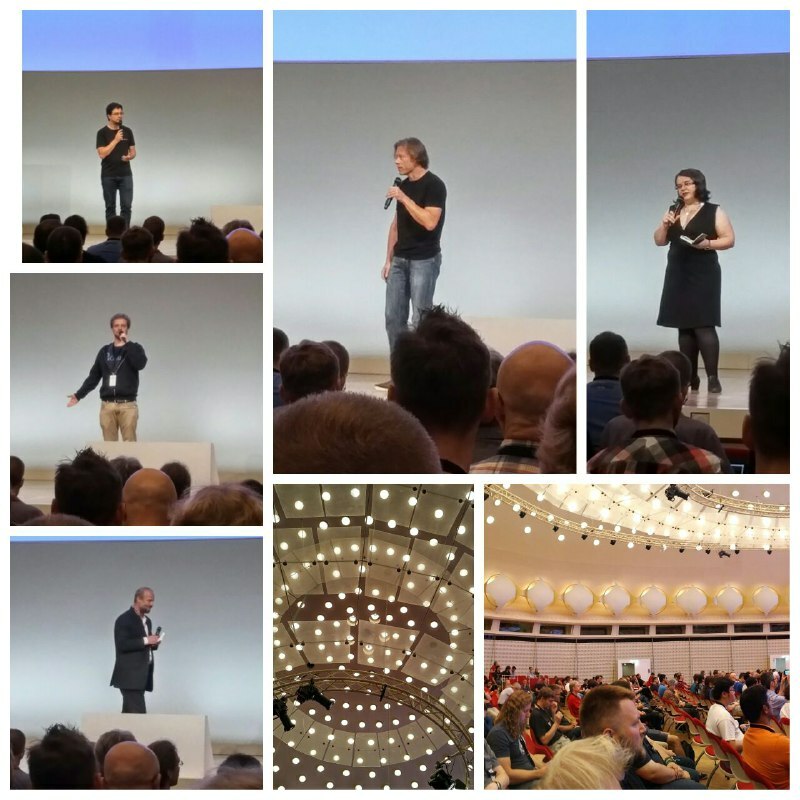 With the keynote over the massive conference begins. Thirteen rooms of talks running for three days over tracks covering Community, Web, Best practices, Automotive, Mobile and Embedded, Let‘s talk business, Tooling, QtQuick, Multithreading, OpenGL and 3D. Let the exploration begin!